The Master in Directing for Devised and Object Theatre offers advanced studies in the practice of the process of devising a theatre performance from scratch. In the program students learn to create theatre performances with strong visual, spatial, object and media (low tech) aspects, as well as other performance forms such as scenographic installations, sound performances, performance interventions etc. The process is based in devising techniques: creating thematic, conceptual, and/or documentary projects that are not based in pre-written plays, but are created through the process of rehearsing, often as collaborative work of the whole creative team. Students will learn to work with variety of authentic, found, and created material: poetry, images, fragments of plays, songs, historical events, personal stories, scientific findings, common knowledge, pop culture etc. Students will further learn a conceptual approach to research and development of materials, creating specific performance structures (in the sense of narrative, space, and relationship to audience) for specific material, and proposing new ways for audience to perceive/experience the performance. Students will also learn to perform and produce in order to have skills to become independent creators. The Department of Alternative and Puppet Theatre has since its establishing in 1952 achieved international recognition and has since its beginnings cultivated new approaches to theatre making. It is vitally connected to the distinguished tradition of Czech puppetry, yet integrates the newest theatrical trends in the areas of object theatre, media and visual arts. During the course of four semesters, students will encounter theatre makers such as Handa Gote, Cristina Maldonado, Stage Code, Kamila Polívková, Farm in the Cave etc. Course leader: MgA. 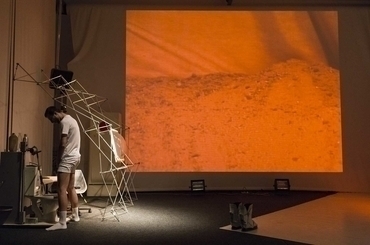 Sodja Zupanc Lotker, independent dramaturg working with devised, site-specific and low tech media theatre as well as dance; Prague Quadrennial artistic director 2008-2015.